Hookedblog checked out this new Banksy piece yesterday. Fantastic work and great to see everyone enjoying the piece, had three long conversations with random locals about the pieces while I was taking some pictures. Lots of others kept stopping and asking if we knew who did it or if we were Banksy! Good to see the piece is getting the local community to stop and chat to each other. Also had a long conversation with the guy who turned out to be the owner of the building, he had never heard of Banksy until Monday morning when one of his tenants in the building called him to say it had graffiti on it. Was asking us loads of questions , asking if we were journalists and if we knew weather it was a Banksy or not as it wasn't signed. 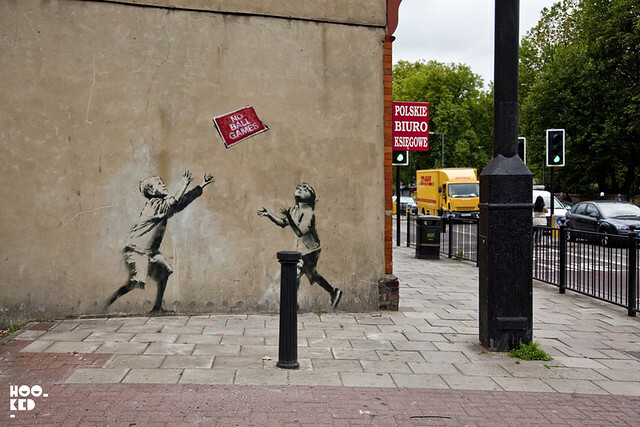 He then pulled out a print out from the web about the sale of the Banksy wall in Portobello Road!! He had also been doing his research as he was showing me a post on the Slam Hype website on his Blackberry which had some of Romanywg pictures featured in it. Another girl I spoke to was from some local community group and had some dealing with the council. She said the local council have already been out to see the stencil piece and she is pushing them to keep it and not remove it as she thought it was a fantastic piece and wanted it to stay for all to enjoy. Will be interesting to see what happens to the piece. The new work is located in North London, at the corner of Tottenham High Road and Philip Lane. 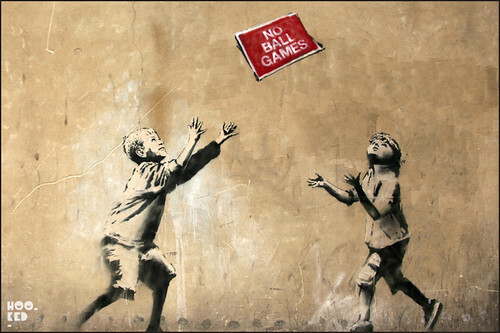 think about whether it is a Banksy, and how much they might get for it. did it or if we were Banksy! ". paintings. I had to change my route to avoid him."